Please call owner Paul at 906-286-0232 or 906-341-5536. Boat is in Manistique Michigan. 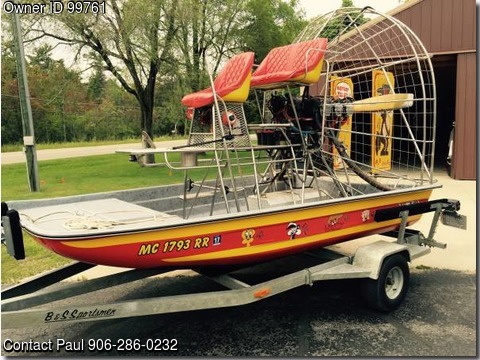 1995 Airboat – 13′- 8″ length, 82″ beam. Stainless Steel cage and frame, polymer bottom, has a Continental Aircraft Engine E-185 6 cylinder and includes Galvanized trailer. Runs great, very fast and LOTS OF FUN! Do not need help selling.